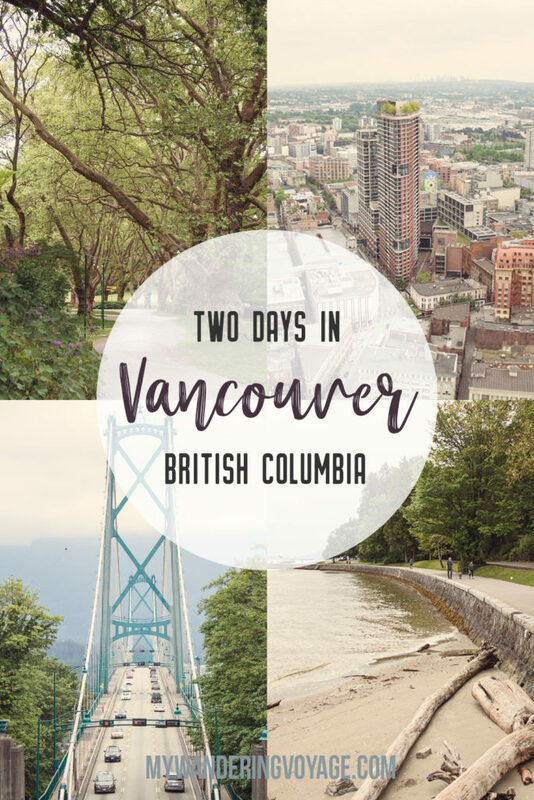 If you’re spending at least two days in Vancouver, then you’re going to want a mix of both urban and nature exploration. From the top of Vancouver Lookout, you’ll be able to see how ingrained that vibe is in this city. Vancouver is Canada’s second largest city and is located in the lower mainland of British Columbia, Canada’s most western province. 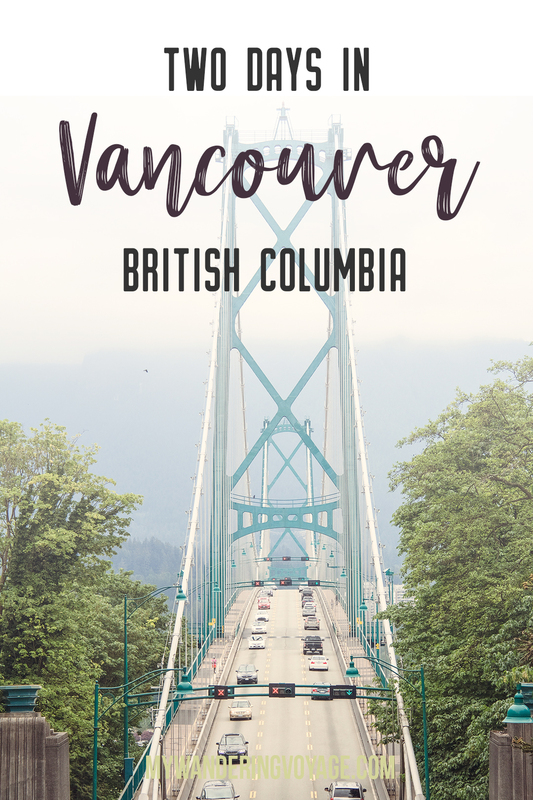 Over 600,000 people call the city home, and almost 2.5 million live in Metro Vancouver, which encompasses West Vancouver, North Vancouver, Richmond, Surrey, Langley, Burnaby and more. 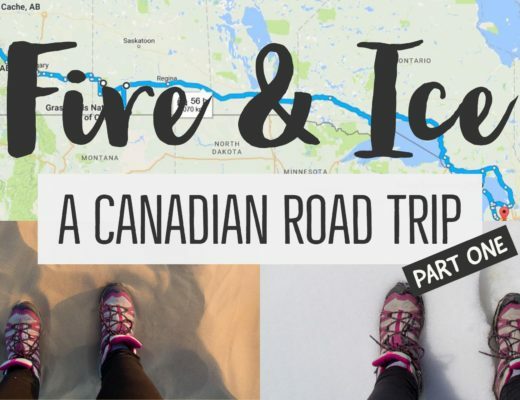 The city lies in a temperate area of Canada – so it doesn’t get very cold. 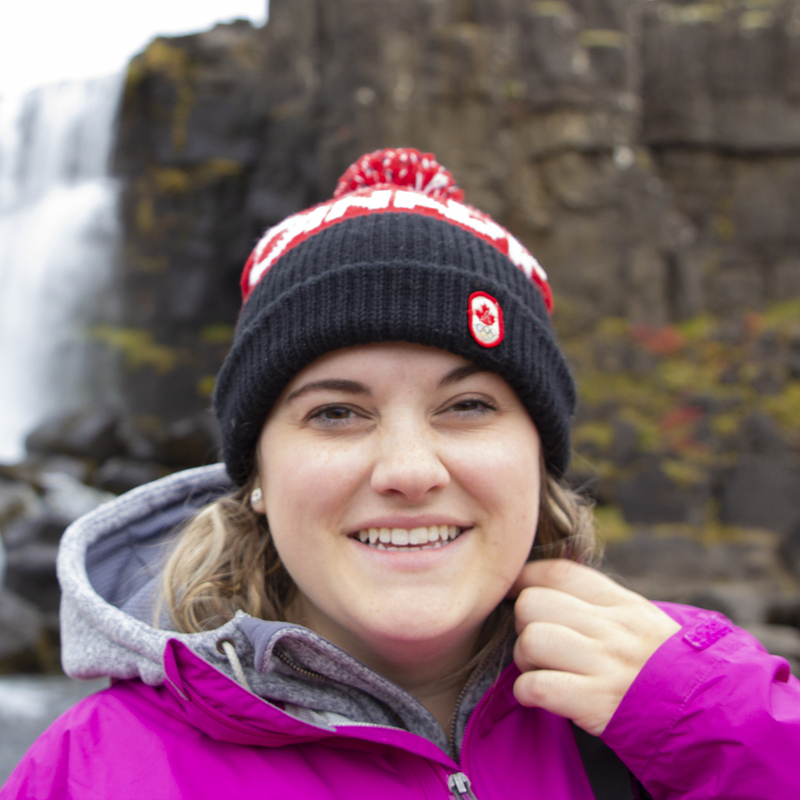 It’s one of the warmest cities in Canada. That being said, if you’re from a warmer climate, you may still find Vancouver winters on the cooler side. Rain is a visitor’s worst enemy. It rains one of every five days in summer and one in every two days in the winter months. 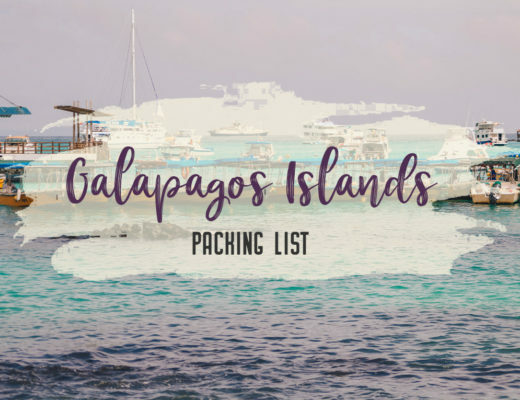 An umbrella or a raincoat is an essential item to pack for this area. Vancouver has a very hip vibe – with trendy restaurants and cafes as well as a thriving arts and culture scene. It’s also an excellent spot for some star gazing – and it has become a great spot for film production. Just some of the big movies shot here include Deadpool, Big Eyes, Percy Jackson, Juno, Twilight Saga, Tomorrowland and more. So pack your bags and grab your camera, it’s time to explore Vancouver, British Columbia. There’s nothing like a spot of breakfast and caffeine to get you fuelled up for a day of exploring. 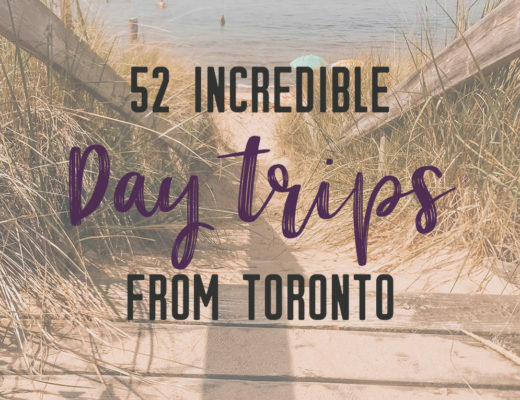 In Vancouver, there are so many options to choose from, including the chain stores like McDonald’s or Starbucks, or the independently owned hip shops like Musette Caffè, Revolver and more. But I suggest starting at the Blue Parrot Espresso Bar on Granville Island. As you feast on many of their delicious breakfast options, you can wait for the rest of the island market to open up. The Blue Parrot is a great spot to start the morning. You can watch the city start its day from the window while munching on a tasty breakfast sandwich. 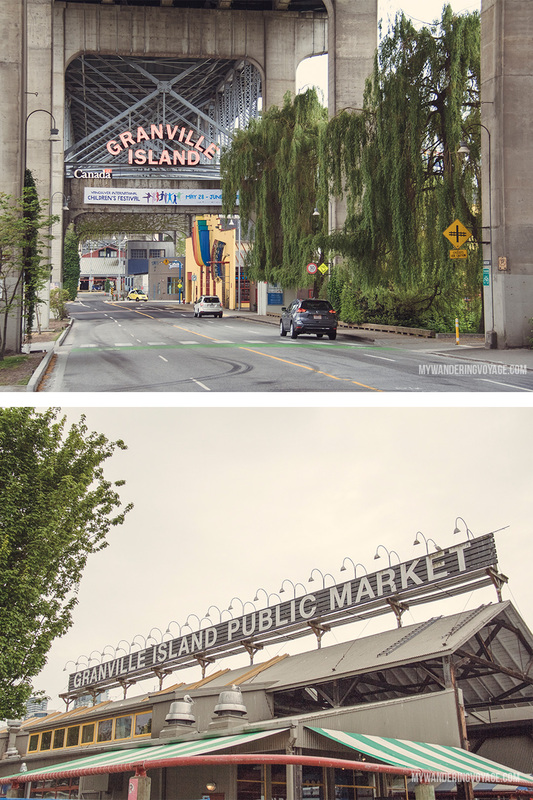 To get to Granville Island by public transit can be a little tricky, as there aren’t any stops on the island itself. The easiest way is to take any one of the southbound Granville Street busses and get off at the Cloverleaf stop and walk the rest of the way. Or you can take a water taxi to the Granville stop. 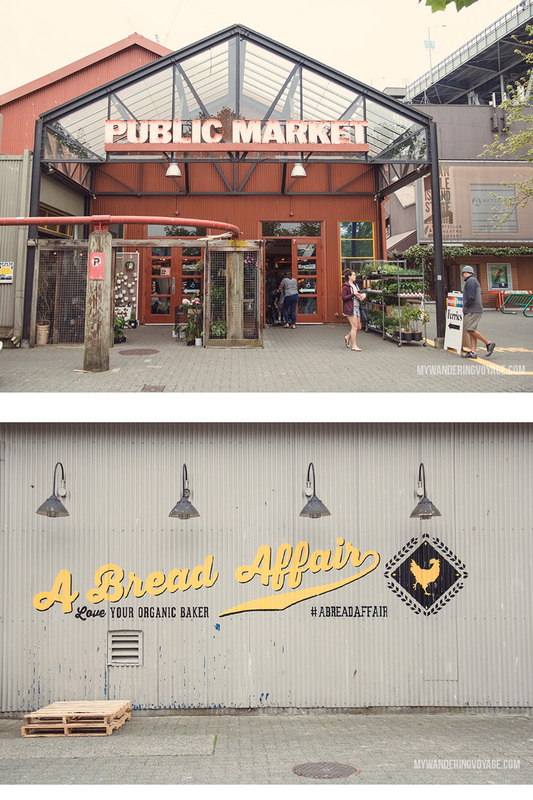 Now that you’re fuelled up and ready to start the day, so is Granville Island. Granville Island was a sandbar in False Creek and once stabilized, it became home to Vancouver’s industry in the 1900s. Industry gave way to commercial buildings and a public market that was set up in the 70s. Now it houses over 275 businesses, including artisans, cafes, restaurants, galleries and more. Wander through the amazing public market, and pick up a few snacks for the road. 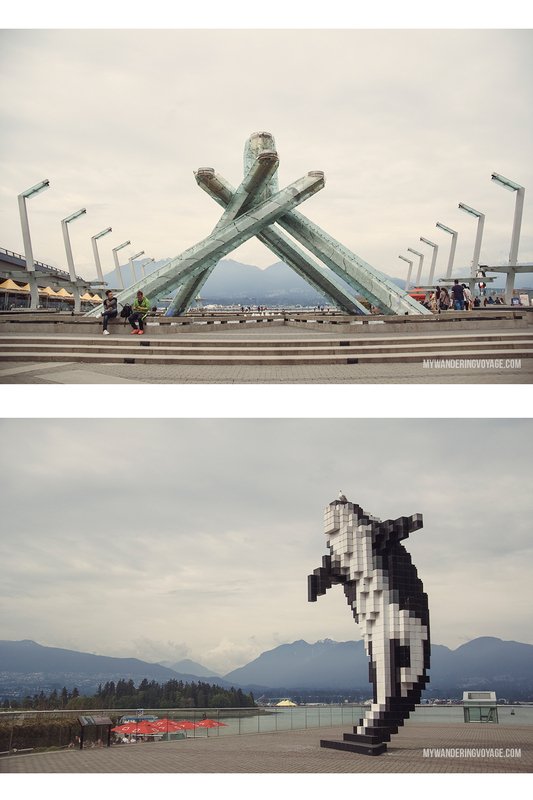 It’s time to get moving since there’s so much more to see in Vancouver. Since you’re on an island, the best way to get off is by boat. 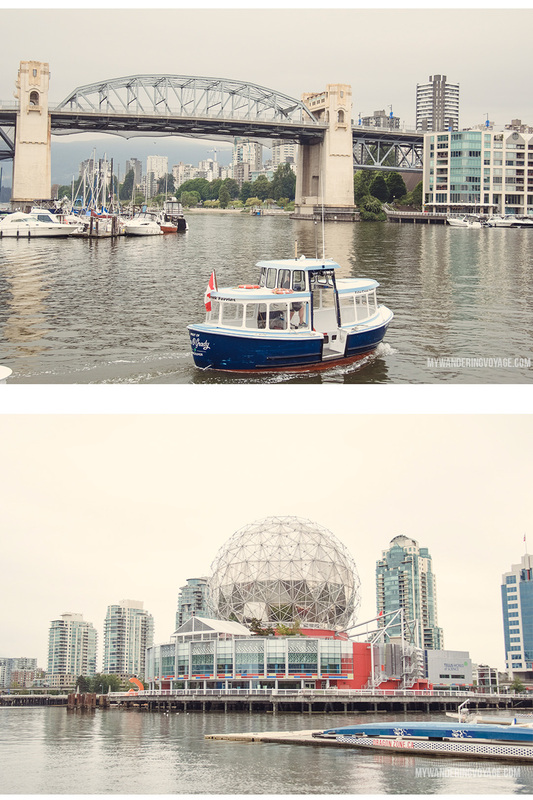 There are two ferry services in False Creek, False Creek Ferries and Aquabus. 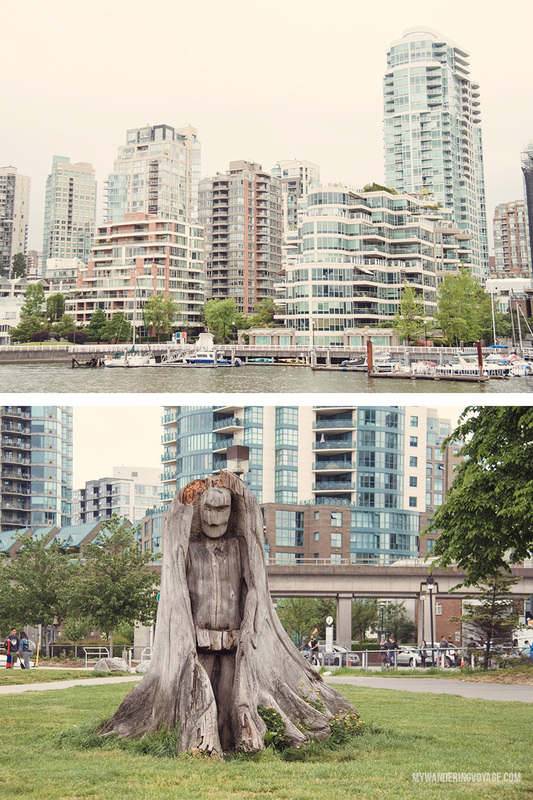 They both stop at many of the same stops including Granville, Stamp’s Landing, and Yaletown. Low and behold, False Creek was named after the fact that it is indeed not a creek. It’s not a place for swimming, with decades of pollution from industry, but it is a nice boat ride from Granville all the way to end of the creek. Take the ferry all the way to The Village to get off and explore the Olympic Village. Built for the 2010 Winter Olympics, the Olympic Village has become a trendy spot to relax after a day’s work. There are bars and restaurants as well as public art and parks. As you wander around this area of Vancouver, you can explore the outside of the Telus Science World. If you have kids or love science, then go ahead inside. I love science but passed along the chance to go in, because I wanted to explore the rest of the city. Follow the North False Creek Seawall, then head up Carrall Street, through Andy Livingstone Park and onto Vancouver’s Chinatown. This area has a rich and complicated history in Vancouver. 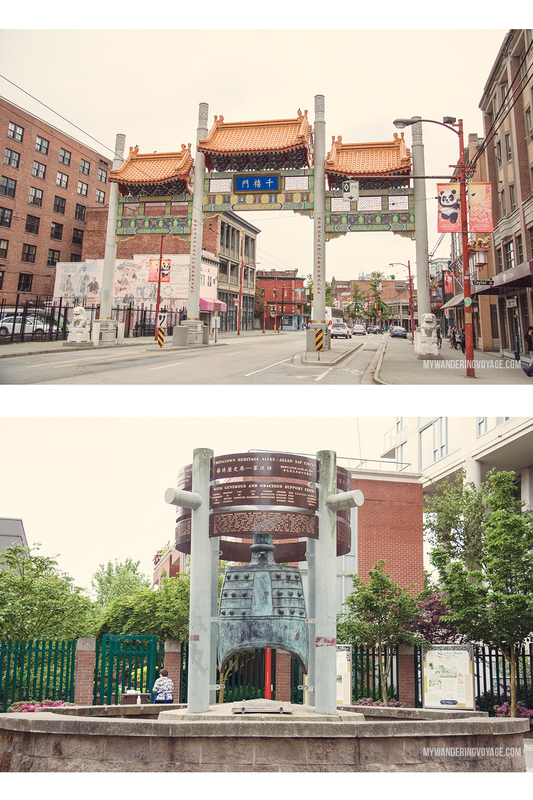 Stop and admire Shanghai Alley, Chinatown’s Heritage Alley, and read up on the history of Chinese immigrants to Vancouver. Make sure to check out the impressive Millenium Gate and the Sam Kee Building. 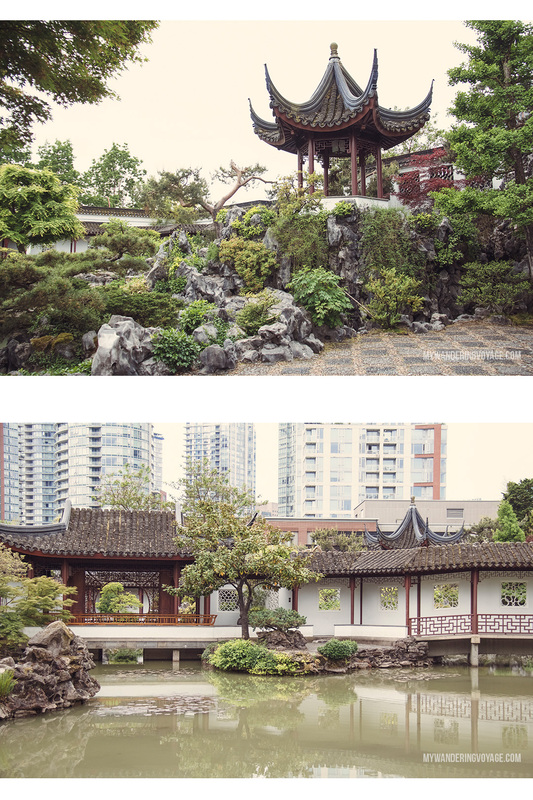 The real gem of this area is Dr. Sun Yat-Sen Classical Chinese Gardens. There are two parts to the garden, one is a free public park, and the other is the first scholars’ garden built outside of China. This tranquil place is there to educate and promote Chinese culture. It was named after Dr. Sun Yat-Sen, the “father of modern China” who visited Vancouver many times during his life. Next, head over to Gastown because it’s time to dig into some fantastic tacos. Before you dig into Gastown, stop at Tacofino and gorge on delicious tacos. What started in a food truck in Tofino, BC, became an urban sensation. Tacofino Taco Bar in Vancouver is a delight. It’s a perfect place to enjoy a meal and relax. 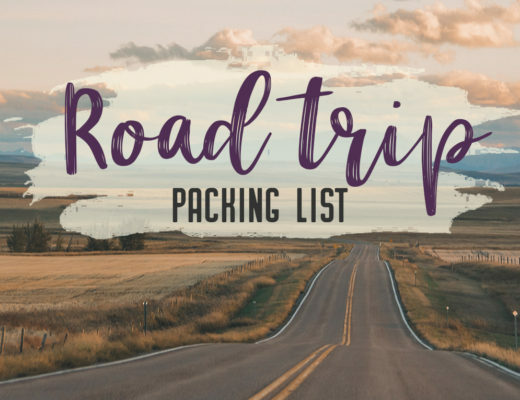 Now you’re all filled up with delicious tacos, it’s time to get back to exploring. Gastown is one of my favourite neighbourhoods, with its deep red brick and tree-lined streets. Start at Maple Tree Square, where there’s a statue of Gassy Jack. Gastown was the original settlement of Vancouver and named after Gassy Jack, who opened the first saloon. 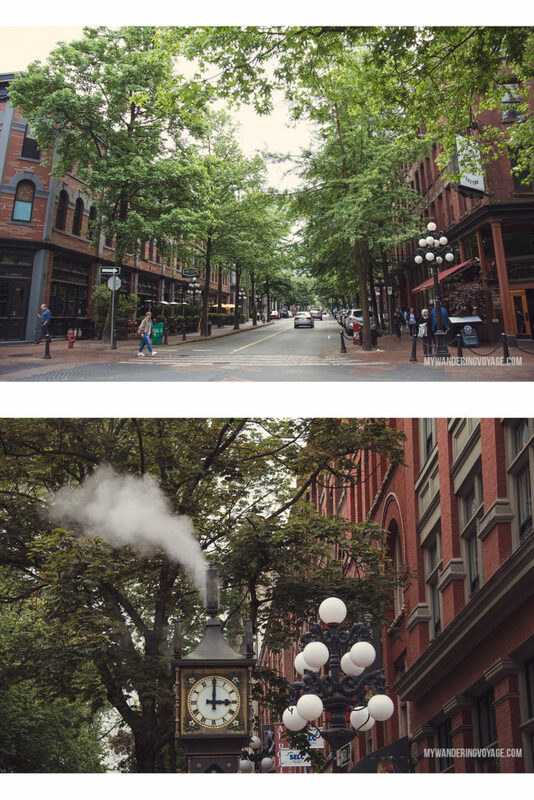 One of the major attractions of Gastown is the steam clock. At every 15 minutes, the clock lets out a tune through its steam whistles. The best view of the Gastown Steamclock is across the street next to the Starbucks. Wow it’s been a long day, and you’ve already seen so much, but there’s still so much left to see. Time to head to Canada Place, a convention centre that is made to look like a ship. Who doesn’t love a bird’s eye view of the city? Vancouver Lookout is the best place in the city to see it all. 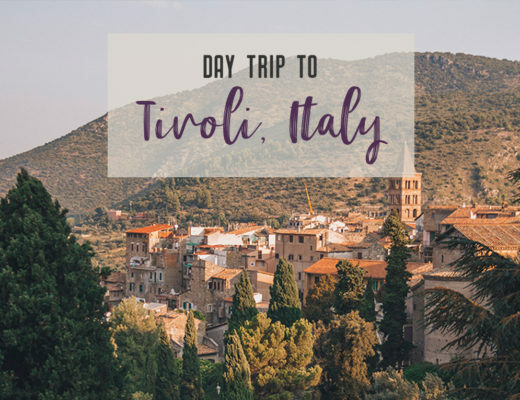 Heading up nearly 170 metres by a 40-second elevator ride, you’ll be able to get a stunning 360 of the city. 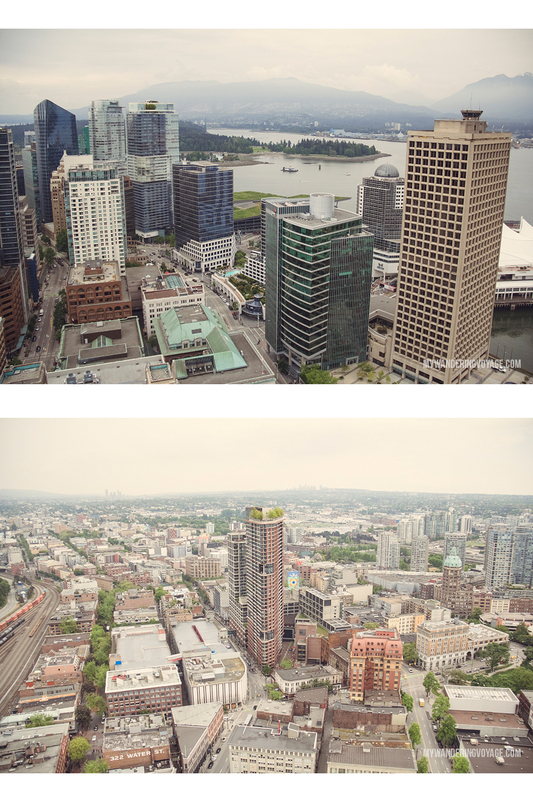 From here you’ll get a bird’s eye view of each of the Vancouver neighbourhoods. 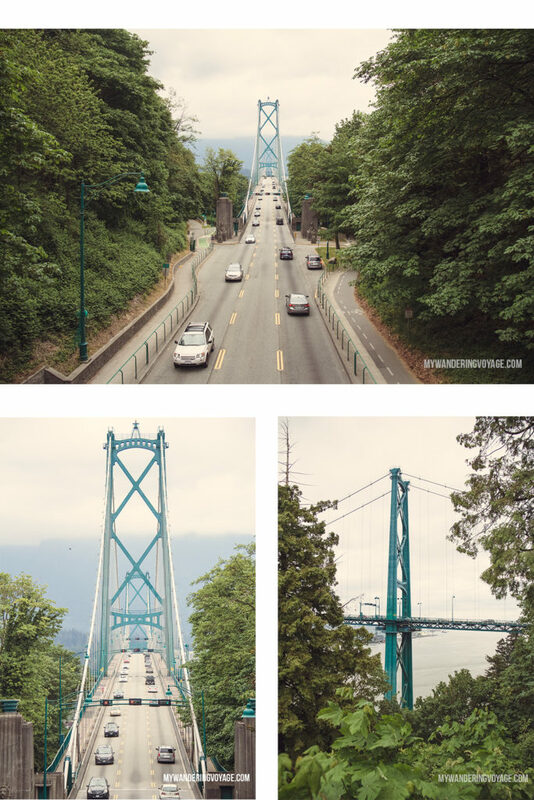 You’ll be able to see Stanley Park as well as the metro areas of the surrounding city. TIP: Make sure to get the best bang for your buck with the Vancouver Lookout. Some hotels and hostels offer discounts to those who want to go up in the towner. Tickets are valid all day, so be sure to come back and see the city lights at night. Canada Place is also home to The Canadian Trail where the names of cities from coast to coast to coast are written. It’s also where big cruise ships dock. Grab yourself a gelato from Bella Gelateria to keep yourself cool for the next round and chill out under the Olympic Flame. Finish your evening at a restaurant on Granville Street, Vancouver’s entertainment district. 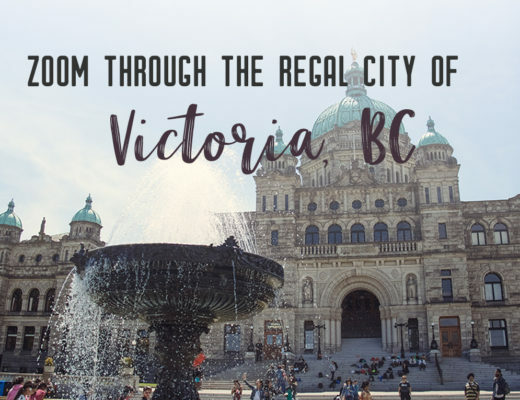 It’s home to flashy neon lights, bars and restaurants as well as the Vogue and Orpheum theatres, historic theatre venues. 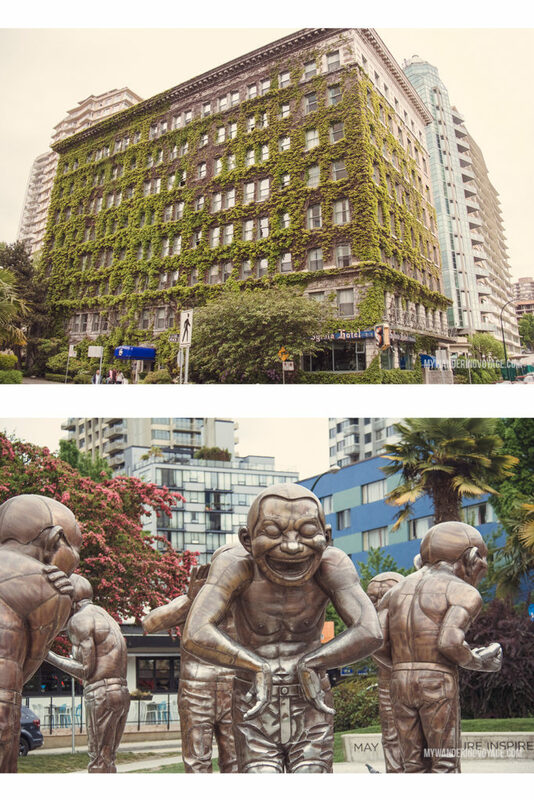 It’s a popular spot for late-night entertainment and is where two of Vancouver’s hostels – The Samesun Vancouver and Hostel International Vancouver Central – are located. The brunch vibes are real – and that’s the best way to start day two on your Vancouver adventure. There are many places to choose from, including Medina or Jam Cafe. Whatever you choose, you won’t be disappointed. 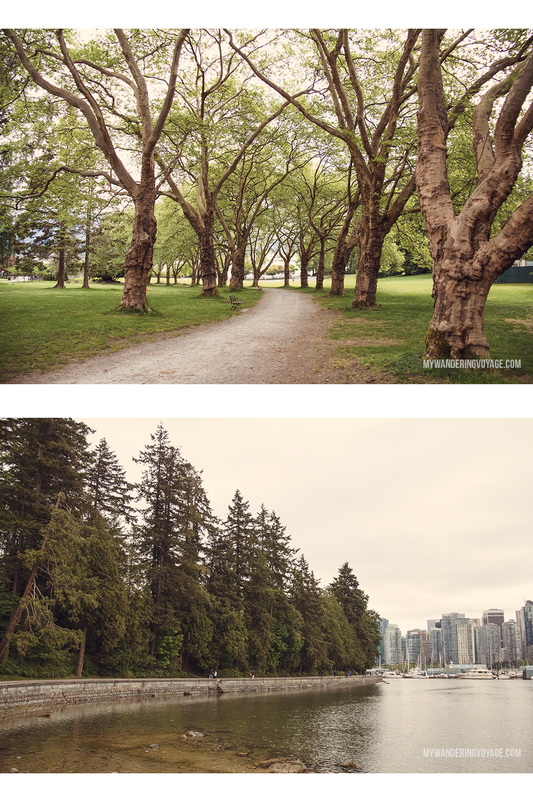 Stanley Park is a massive, 400-hectare park that can be explored by foot, car or bike. But the best mode of transport for those wanting to see the sights in the Hop-on, Hop-off bus. There are plenty of stops in the park to see it all. 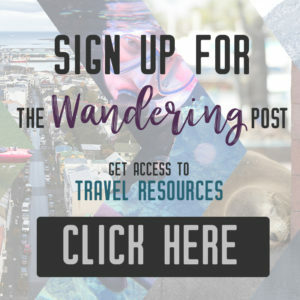 Grab a park route ticket ($49 but some hotels and hostels have deals). Catch the bus at Robson Shopping District (P4) and hop off at P6. 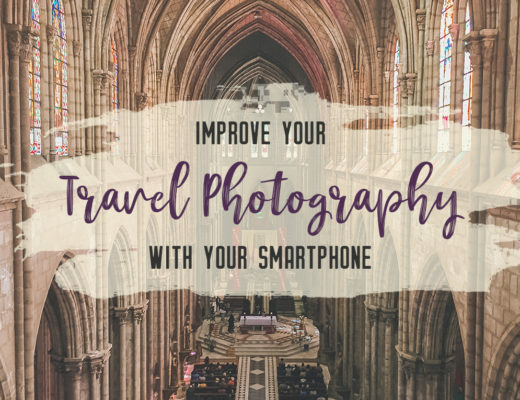 From here you can explore the Stanley Park Rose Garden, Shakespeare Garden, Stanley Park Railway, Lumberman’s Arch and Vancouver Aquarium. 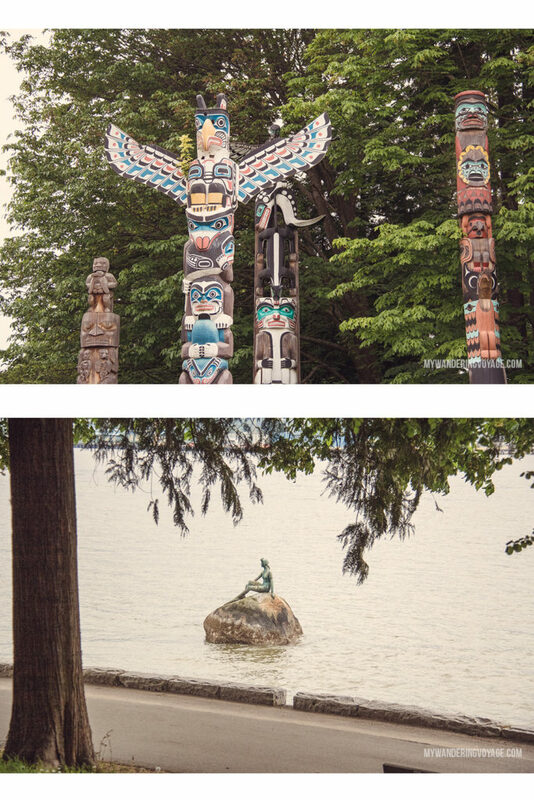 Hop back on the bus and get off at P8, where the Totem Poles are. Here you can also see the Vancouver Seawall, the Nine O’clock Gun and the Naval Museum at HMCS Discovery. Once again, grab the bus again. On your way to P9, make sure to look out for the Girl in a Wetsuit statue in the water on your right side. P9 is Prospect Point, which was once a signal station for passing ships. Check out Lion’s Bridge, which rivals in beauty some of the other suspension bridges in the world. You won’t want to miss the lookout over Burrard Inlet and a refreshing treat from locally-made Rocky Point Ice Cream. At P10, you’ll be able to explore the Front Tea House Restaurant, but you’ll want to keep going to P12, English Bay. It’s been a while since brunch, so let’s go on a search for some food. English Bay is an older downtown neighbourhood. The high rises are smaller, and it’s dotted with cafes and restaurants. Since Vancouver is a coastal town, try the catch of the day at one of the many seafood restaurants along English Bay, like The Boathouse restaurant, Beach Bay Cafe and Patio, or Cactus Club Cafe. What’s better than sunset on the beach? Nothing, because you’ve got the gorgeous golden hour, sand and the sound of the water beat against the shore. 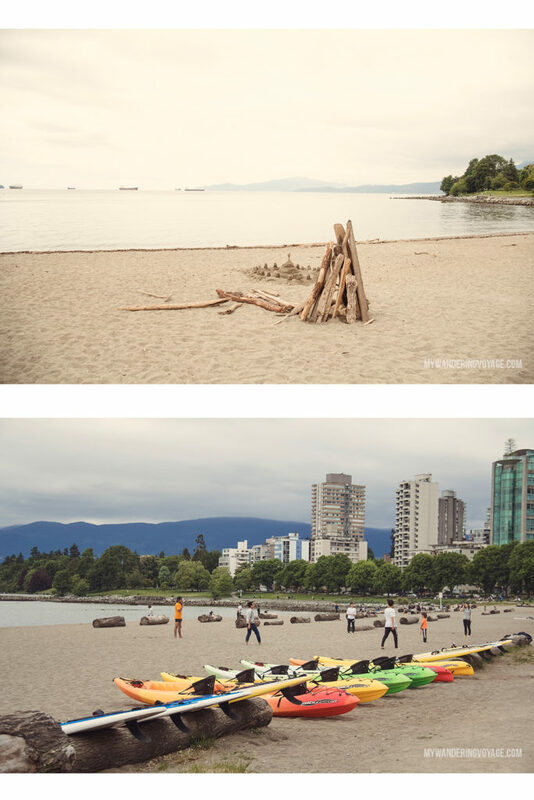 English Bay Beach is a great place to watch the sunset on Canada’s most western province. 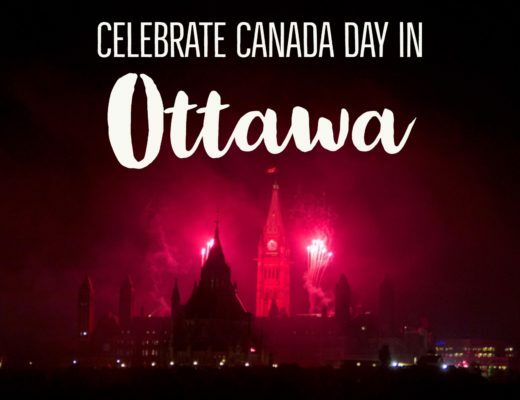 For two weeks in the summer you can catch the annual fireworks competition, the Celebration of Light. If you’re in the mood to get on the water, then you can rent paddleboards and kayaks and head out on an adventure. From old industrial buildings to hip bars and trendy restaurants, next is Yaletown. It may be closed when you get there, but take a peek in the museum and see Engine 374, which pulled the first passenger train into Vancouver back in the late 1800s. Yaletown has some amazing patios, so choose one and enjoy some late night appetizers and cocktails. Try Yaletown Brewing Company, Cactus Club, Brix and Mortar, or West Oak. It will be a fancy night out, but one you won’t forget. 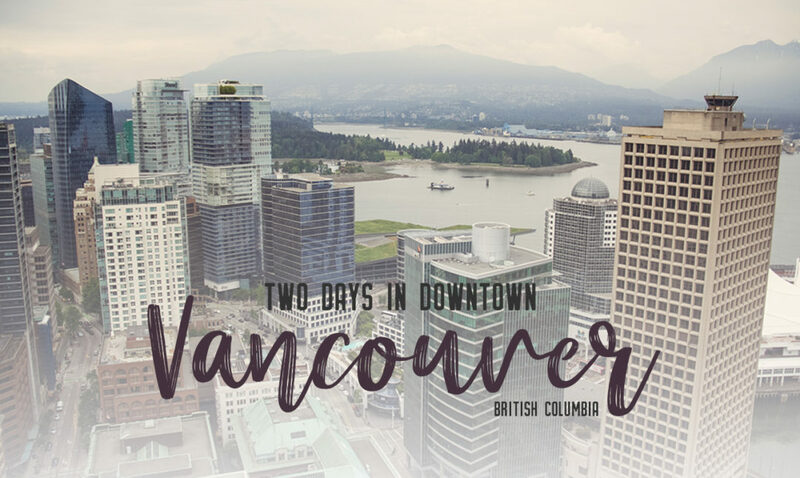 Vancouver is a trendy and modern city with so much history to explore, so pack your bags and let’s go!